NoahsArkCollection is a wonderful etsy store full of animal themed items. While not quite lined up two by two animal charms and beads are present in multitude. You will find dogs and sea creatures, birds and wild things, and even a fantastical Pegasus! The shop boasts a large variety of animal charms in sterling silver , some of them enhanced with gemstones and crystals. There are rustic animal beads and focals carved from bone and fanciful ones made of ceramic and glass. NoahsArkCollection also offers finished jewelry-all animal related of course. Take time to look at the animal shaped jewelry boxes. Could there be a better way to present a gift from NoahsArkCollection? Your visit won't be complete until you look through the shop sections for beautiful silk paintings and colorful animal sculptures. They are sure to make you smile and all have been handcrafted by the talented artisan-owner of NoahsArkCollection. 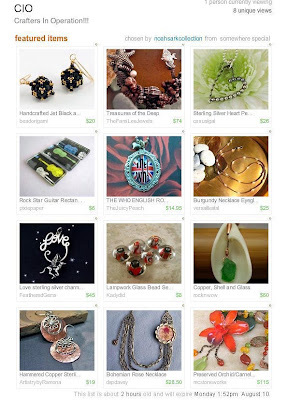 TheFamiLeeJewels are currently featured in a treasury curated by NoahsArkCollection. Thank you for including us in your wonderful collection CIO-Crafters in Operation.